Back in March I wrote a post called "Levelling My 10th Alt", in which I mused on how to keep the levelling process fresh when you've already done it more than a couple of times, and wondered which of my alts was going to be the next one to hit the level cap. As happens to me quite frequently in this game, I got distracted by max-level activities soon afterwards, and for the next six months, none of my alts really went anywhere. I think my Vanguard still hasn't finished her class story on Balmorra. My Shadow actually hit 50 back in April but my pet tank and I felt little drive to continue levelling our consular duo for some reason and only got back to it very sporadically. 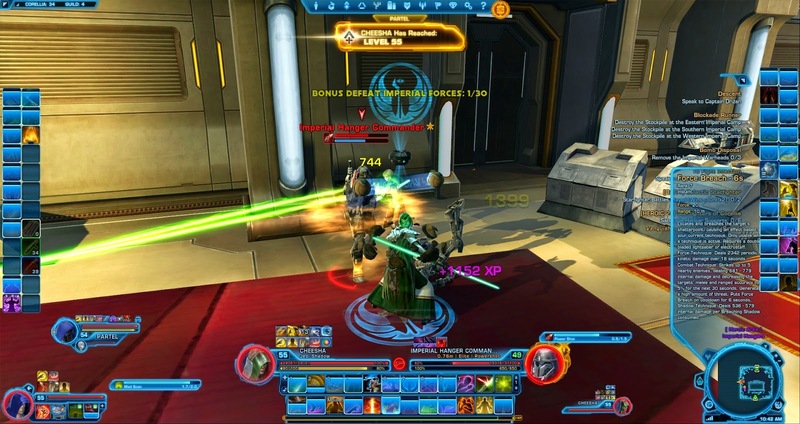 This weekend however, we finally got there: while we're only at the end of Voss in terms of story progression, we went to Corellia to do some heroics for this week's conquest event, and those provided us with the last bit of XP we needed to hit 55. I'm oddly happy to have reached the nice, round milestone of having ten characters at the level cap, and specifically to finally have a tank on Republic side. (Not to mention that Shadow/Assassin was the only advanced class I hadn't played to the cap in either of its incarnations yet.) While I levelled my Powertech in tanking spec last year, we don't run endgame content in our Imperial alt guild that often these days. I think I tanked Dread Fortress on story mode twice, Scum and Villainy once and that was it. Based on my experiences back in WoW and in general, tanking isn't exactly my calling, but I can do a decent enough job at it with a bit of practice, and especially when it comes to alt runs tanks are often something that we're short on. I'm also a very lazy raider to be honest, in so far as I tend to only really pay attention to the parts of each fight that are actually relevant to my role. Seeing how I'm playing a healer the vast majority of the time, with a healer main and two healer alts at 55, this means that I don't have much of a clue about a lot of important fight mechanics. I vividly remember the first time I came along to Terror from Beyond as dps and just how much of a surprise I was in for during the second phase of the Terror fight. You mean I have to do something other than stand on a single platform most of the time and cast the occasional heal?! While I've had a chance to do pretty much all operations as dps at least on the easier difficulties by now, tanking is still a great unknown to me when it comes to endgame. I think I'll quite enjoy getting a chance to finally unravel those old familiar fights from the one point of view from which I haven't seen them before. You know you've got it bad when you have 10 L55s. I still only have one. That surprises me! I thought you would have had a chance to level at least one alt by now.